Bring the clear and didactic art of Netter to your patients! 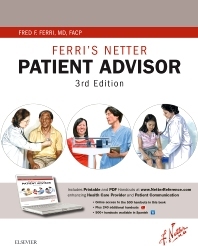 Make patient engagement and compliance as easy as possible with the new edition of Ferri’s Netter’s Patient Advisor. These printable handouts pair clear explanations by renowned author Dr. Fred Ferri with thousands of Netter and Netter-style illustrations for a greater understanding of each health condition and what patients can do to facilitate their own care. Highly visual and succinct handouts were designed to offer patients the information they need to know in a quick, memorable format. PDFs include a space for notes and a field for Health Care Provider information. Browse the text by specialty or alphabetically. Handouts are designed in a single-page (front/back) format for convenience.